A Tonk's Tail... err, Tale...: "Play us a song, Mister Piano Cat"
Have a serene big easy Sunday and yes we request 'Easy Like Sunday Morning' as we think that is fitting LOL. Hmm...does yous knows the Alley Cat Strut? Can you play Nashville Cats for me please. Alley Cat Strutt please. If you played it earlier, please play again. It's M's favorite! I just love this! Posted on Pinterest, Twitter and Cody's fan page :) Too cute! He could do a duet with Nora! Maxi likes those bass notes. That is so cool! I love your photo. We saw a flash of fang! Mommy bets Max can feel the vibrations and likes it! That was quite the tune! Thanks, Maxwell. 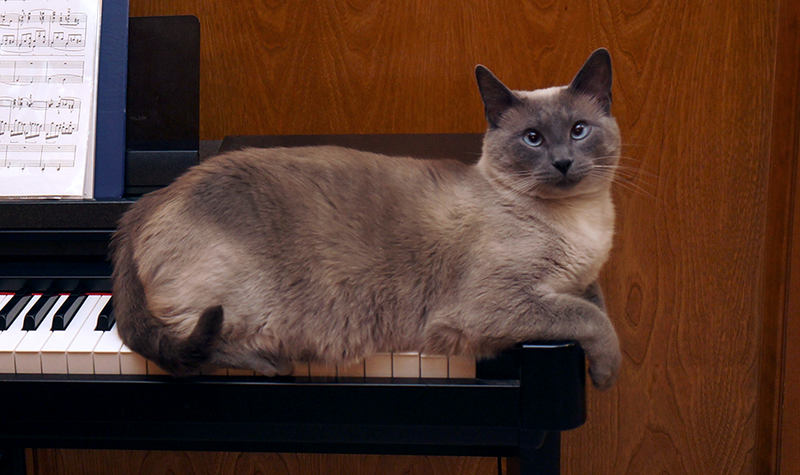 Maxwell you are quite the piano cat. Great to see you live. Wonderful pic of you and the piano too!